In order to establish copyright infringement, a plaintiff must prove: (1) they own a valid copyright and (2) the integral elements of the work that are original must have been copied. Direct evidence of copying may be difficult to prove, but may be inferred by showing that a defendant had “access” to the copyrighted work and that the allegedly infringing work is “substantially similar”. The Court in this case did not need to discuss access as the issue of substantial similarity was dispositive of the dispute. The Seventh Circuit addressed the issue of substantial similarity just last year in Design Basics v. Lexington Homes. 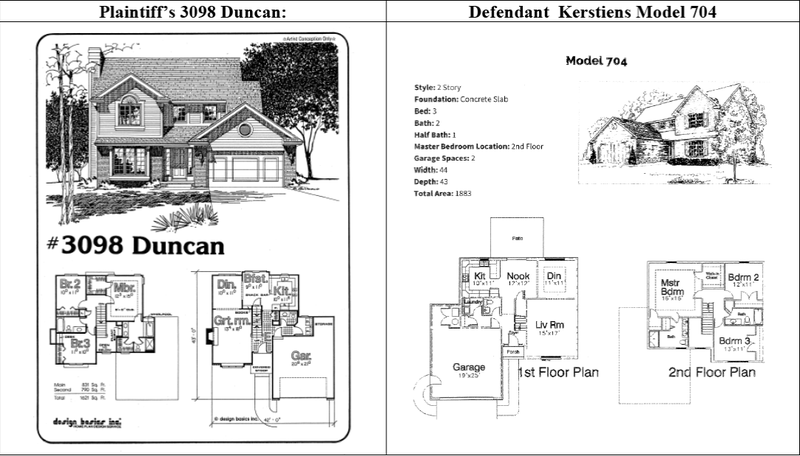 In that case as in this one, the court found “[the] accused plans resemble Design Basics’ plans, but only because both sets resemble common home designs one might observe throughout the suburbs of Milwaukee, Chicago, Indianapolis, or many other communities.” Lexington Homes, 858 F.3d at 1102-03. Further, the court stated “[t]here are only so many ways to arrange a few bedrooms, a kitchen, some common areas, and an attached garage, so not every nook and cranny of an architectural floor plan enjoys copyright protection.” Id. Based on the Seventh Circuit reasoning and facts in this case, the Defendants, represented by Overhauser Law Offices, were the prevailing party. The case was filed in the Southern District of Indiana to Judge Tanya Walton Pratt and Magistrate Judge Doris L. Pryor and assigned Case No. 1:16-cv-00726-TWP-DLP.